These steps were gleaned from the work completed by Reinhard Seiler. Other than the manual download and placement of the TrueCrypt source, the rest should be fairly hands off. So first, get the “TrueCrypt 7.1a Source.tar.gz” package from http://www.truecrypt.org/downloads2 and copy it to /usr/local/src/ on the Raspberry Pi. Finally, copy the compiled ‘truecrypt’ binary from /usr/local/src/truecrypt-7.1a-source/Main/ to /usr/local/bin/. It appears as though it may be due to a particular kernel module not being compiled in. 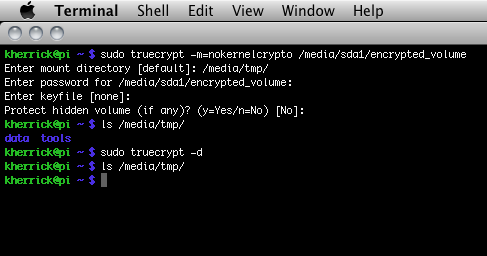 So I added the “-m=nokernelcrypto” command line option and was successful. For more command line usage, see their website @ http://www.truecrypt.org/docs/?s=command-line-usage. I haven’t tested it yet, but it should work graphically as well. While there are some compromises in the process described above, it was the only way I could get it compiled in the time I allotted to the task.